Originally from Cooking Light, Chewy Chocolate Macaroons are one of my favorite ways to use condensed milk.F The original recipe calls for fat free condensed milk, so feel free to use that if you have some. I use regular condensed milk and I always add some semisweet chocolate chips. Mine aren’t quite as light as the Cooking Light Chewy Chocolate Macaroons, but they are worth the extra calories. Preheat oven to 250°. Line a baking sheet with parchment. 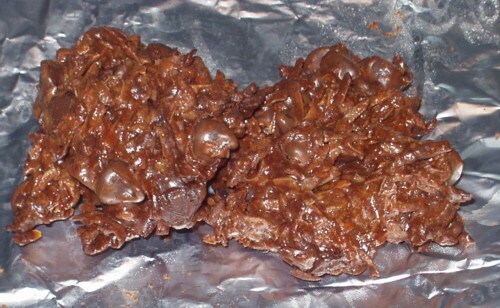 Melt unsweetened chocolate in microwave. Spoon flour into a dry measuring cup; level with knife. Combine flour, cocoa powder and salt. Add coconut to flour mixture and toss well. Stir in melted chocolate, vanilla and condensed milk. I never thought these could be so delicious and turn out so perfect! I had to make some last minute sweets tonight for a meeting tomorrow. They are the perfect amount for a party or big group. Thank you so much for this recipe….I love it! These cookies look really good but takes a long time in the oven. Can you bake them at 350 for 10 minutes like regular cookies or will it ruin the texture? thank you so much i haven’t had or heard of these cookies in 20 years and tried to find it and finally after this long i have.We always called these cookies spider cookies thats why i could find them i guess but thank you. These are great! I made them to bring to a Christmas party (every cookie/dessert buffet needs a good macaroon) and I made them for dinner guests tonight. They were a hit both times! Love these and they come together VERY easily. No. It’s not a trick of light. I was going through this phase where I put chocolate chips into everything. So yes, there are some chips there. Your pic looks like there were chocolate chips in the cookies. Is that just a trick of the light? Your post (Chewy Chocolate Macaroons) was on target for cooking lobster recipe. It’s interesting to know that many people don’t understand cooking lobster recipe, good job. What I would like to see is more info on cooking lobster recipe and cooking lobster recipe. Any post you make on cooking lobster recipe in the future will be well received. Yay! At least I did one useful thing this weekend ;).